Intro by Campsite... 'Welcome to the Lot et Bastides campsite ***! Imagine watching the sun set after a relaxing day of fishing on the banks of the river Lot. 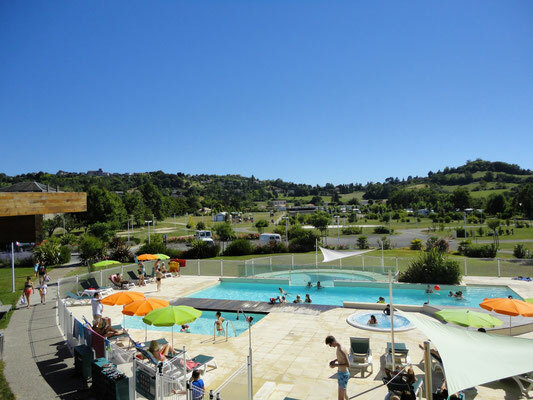 Maybe you ’ve just returned from cycling through some of France’s most glorious countryside, or perhaps you’ve spent some hours cooling off in the pool.The sound of laughter from children playing volleyball and the thud of Petanque balls landing on the ground fills the air. The waft of local gastronomic delights from the nearby medieval village of Pujois is tantalising your taste buds. Perhaps you are enjoying one of the many wonderful local wines as you look up and notice the street lights in the village pop on one by one as night begins to break….